I cannot believe how good our Lake Trout fishing has been. 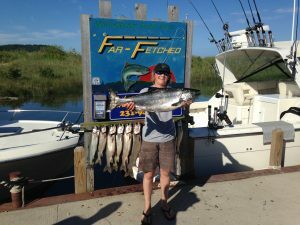 We continue to have almost limit catches and some fish are in the ten pound range. This is the best kind of fishing for kids. Lots of action and smiles when that many fish are getting in the boat. I just had a great report from a port just south of us that he caught three nice salmon. I have been seeing a lot of bait and if we have a batch of salmon move in they might stay a while. I can tell you that a lot of us are hoping that happens.